Funny, isn’t it, how the ‘I follow Paul’ and the ‘I follow Apollos’ crowds forget they are mere human beings. It is as though Steve Chalke believes that the ‘Church people’ who criticise him dwell somewhere in the 8th century BC with Amos and Hosea, obsessed with enemy invasions, political turmoil, royal assassinations, religious decline and social degradation; and that he is the embodiment of the New Covenant of grace and love, passionately pleading for reformation and righteousness (along the lines of his preferred exegeses, obvs). And so he tweets the word of the Lord, who does nothing without revealing His plan to His servants the prophets. Steve Chalke suffers persecution and emotional agonies in his quest to communicate the diverse character of God and warn of how ‘Church people’ have been unfaithful. His vocation is preeminent, even though snares await him on all his paths. If ‘Church people’ break the New Covenant agreement with God, do they not suffer punishment? Is Steve Chalke’s tweet not a warning of that? Is he not actually pronouncing God’s wrath upon those who do not walk in grace? Sin has to be punished, does it not? Or does the power of the Cross extend to the unrepentant? Unrepentant hearts have to be purged, do they not? Or is everyone now saved, irrespective of their faith and belief? The Old Testament prophets warn of the dire consequences of unrepentant hearts: ‘But I will send a fire upon Judah, and it shall devour the palaces of Jerusalem‘ (Amos 2:5); ‘I have sent among you the pestilence after the manner of Egypt: your young men have I slain with the sword, and have taken away your horses; and I have made the stink of your camps to come up unto your nostrils: yet have ye not returned unto me, saith the Lord‘ (4:10). Throughout the OT, idolatry leads to earthquakes, destruction, invasion, and ultimately: ‘Therefore will I cause you to go into captivity…‘ (5:27). God’s judgment is the feeling of abandonment: ‘Then shall they cry unto the Lord, but he will not hear them: he will even hide his face from them at that time, as they have behaved themselves ill in their doings‘ (Micah 3:4). The heathen come under condemnation for violating conscience; the people of God must therefore be trebly under condemnation for they violate conscience, revelation and the love which has made them what they are. The Lord demands the separation of His people from all forms of idolatry because He Himself is holy. Is it idolatry to make God in our image? Is it idolatry to be blind to the possibility that we might have done so? Israel was privileged: ‘You only have I known of all the families of the earth‘ (Amos 3:2), but God has now chosen ‘Church people’. He once demanded right and responsible behaviour from Israel, and now he demands right and responsible behaviour from the Church, doesn’t He? Or is the forgiveness of Jesus unconditional? Israel was set apart, but rejected the law of the Lord because they were led astray by false gods. What happens when Christians consult wooden idols and seek answers from a stick of wood? Is it ungracious to ask? Is it pouring wrath on someone’s head to challenge their error? Is the mere assertion of the possibility of ‘error’ a manifestation of a lack of grace? Syncretism is spiritual adultery, which gives birth to an illegitimate generation. The altars for sin offering have become altars for sinning (Hosea 8:11). We have all the external trappings of religion, all the outward rituals and formality, but God’s holiness demands integrity in the inner parts, and a real relationship with Him: ‘I hate, I despise your feast days, and I will not smell in your solemn assemblies. Though ye offer me burnt offerings and your meat offerings, I will not accept them…‘ (Amos 5:21f). The Old Covenant was not an unconditional guarantee of His favour; indeed, the people of that covenant had a greater responsibility to be faithful because they had been given so much, so the pleas were for a holy people to return to their Holy God. Which brings us to the New Testament of love and grace, long prophesied by the OT prophets: for the remnant, beyond the darkness of the hidden face and the distressful pathway, there is the shining light. Though judgment had to be executed, it was not God’s last word. The prophets looked forward to a time when God would bring His people to peace and prosperity; to a time when their hearts would belong to the Lord: ‘Seek the Lord and ye shall live‘ (Amos 5:6). The blessings will be the culmination of the Lord’s love: ‘And I will bring again the captivity of my people of Israel… and they shall no more be pulled up out of their land which I have given them‘ (9:14f); ‘I will be as the dew unto Israel: he shall grow as the lily‘ (Hosea 14:5). The promise will be ‘the acceptable year of the LORD‘ (Isaiah 61:2), when He ‘will extend peace to her like a river, and the glory of the Gentiles like a flowing stream‘ (66:12). There is an enormous sense of refreshing and relief as the prophets talk of Israel’s salvation, and the revelation of Immanuel as the ultimate fulfilment of God’s plan; the Messiah who will establish righteousness and peace. Isaiah and Micah also prophesy the re-building of the Temple, and talk of the day when all nations will worship the Lord there, with the clearest indication that the Lord is a God of salvation and future hope; that He will bring all people under His law and rule of love and grace. ‘And I will betroth thee unto me for ever; yea, I will betroth thee unto me in righteousness, and in judgment, and in lovingkindness, and in mercies. I will even betroth thee unto me in faithfulness: and thou shalt know the Lord‘ (Hosea 2:19f). Is it not necessary for ‘Church people’ to do both the wrath of God and His grace? Are they not inseparable; two sides of the same divine coin? 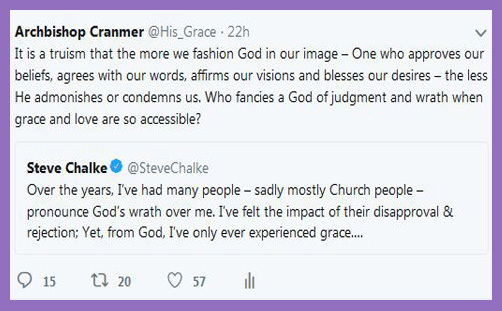 Or are you going to complain that this post dwells to much on the Old Testament apprehension of the character of God, and that Jesus is totally missing; that the Cross is totally misunderstood; that grace is woefully grasped; and that now we must all be more like Steve, because Cranmer is otiose?